So finally it's summer, if at least only by the box office calendar. But we do start off with a doozy of a weekend, with a major franchise action film. It's an interesting exercise to think back to the year 2000, the last time a Mission: Impossible film was in theaters. Bill Clinton was President of the United States, Limp Bizkit was a popular enough band to record the theme song for the film, and its star, Tom Cruise, was widely considered to be sane. How time flies. 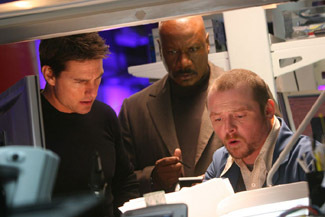 The two previous Mission: Impossible films have been Tom Cruise's own personal attempt at a James Bond franchise, although occurring somewhat less frequently. Both installments have inflation-adjusted totals of just shy of $250 million, which out-Bonds any recent Bond film by a factor of about one-and-a-half. It's about as raw a display of box office star power as you're ever likely to see; though the action-filled and implausibly-plotted films have a built in appeal to audiences, it's clear what Cruise brought to the table here. This makes that third point mentioned above the most troubling to Mission: Impossible III's box office. In case you haven't picked up a People magazine in a while, Mr. Tom Cruise has had a very odd year. His increasingly bizarre public antics have included becoming increasingly vocal about the religion of Scientology, jumping on Oprah's couch, getting into fights with Matt Lauer and Brooke Shields about psychiatry and impregnating Katie Holmes. Suddenly the long-standing homosexual rumors aren't even a blip on the radar. Though last summer's War of the Worlds did not appear to be affected much, opening to $77 million and earning $233 million total, Cruise has only gotten weirder since then and he doesn't have the added boost from Steven Spielberg's name on the credits. There's been enough of a visceral reaction in the media and the public that it probably will affect the box office (it's rare to have your co-stars have to make public declarations that you're not crazy) compared to previous editions, but there are still factors in its favor. The director of this edition is JJ Abrams, responsible for the TV series Alias and Lost and probably the hottest name in TV right now, though he probably doesn't compare to the 2000 version of John Woo (one might recall that that was the beginning of a decline for Woo – and come to think of it, we haven't heard much from Brian DePalma lately, either). Reviews are quite positive, especially regarding Philip Seymour Hoffman's villainous turn. Commercials and advertising have been top notch, highlighting several money shot stunts and its potential status as the shoutingest movie ever. And as the opening film of the box office season, it enjoys a fresh audience who hasn't been blockbustered-out by the week-after-week slate of event pictures. With this in mind, and the massive 4,000+ venue release, we should still see a huge weekend of about $54 million, as Cruise's star power bends, but doesn't break. There are other films released this weekend even if you wouldn't know it, including an offering for pre-teens, Hoot. Based on a book by Carl Hiaasen, it centers around a transplant from Montana to Florida, and his friendship with two kids who find their wildlife sanctuary threatened by commercial developers. A rare burrowing owl makes its home in the area, and the three bond over a summer of trying to protect it. Mild authority-defying hijinks ensue. The child actors are essentially unknown, but they do have some help from Luke Wilson, Clark Gregg, Tim Blake Nelson and Jimmy Buffett (he's big with the 11-year-old crowd). Styled after and targeted at the audience of 2003's Holes, Hoot carries an environmental message amidst a light-hearted romp. It's been fairly slagged for being preachy, and appears like something that would be more fitting on ABC Family channel, but should still find an audience for about $10 million. The third new release sits in the horror genre, entitled An American Haunting, and in the hands of a more powerful distributor could potentially have found itself challenging for serious box office contention. Based on a true story from the early 1800s where a spirit is said to have killed a person (and actually recorded as such in the law books), it ties in those events with a house on the same spot today with a girl perhaps possessed or tormented by that same spirit, and bringing to mind the recent The Exorcism of Emily Rose (and of course, The Exorcist). The film features a young cast of protagonists, along with veterans Donald Sutherland and Sissy Spacek. Released by independent distributor Freestyle, it's suffering from a lack of money for screens and advertising. However, it's got an extremely effective and spooky trailer and could make the most of its tiny 1,667 screen count, assuming the word can get out. Look for it to earn about $7 million this weekend.